When it comes to wealth, the steps you take to protect your assets are every bit as important as the work that went into building that nest egg in the first place. And yet many Americans continue to do very little to ensure that they have the asset protection they need. That lack of attention can place their wealth at risk from threats that only seem to grow in number with each passing year. The failure to protect assets can have dramatic consequences for your family’s financial security, and can deny you the financial freedom you deserve. Our asset protection team can help you to avoid those risks. What threats pose a risk to my assets? What Can I do to safeguard my wealth? How can a California asset protection attorney help? At Litherland, Kennedy & Associates, APC, Attorneys at Law, we’ll assist you in using the latest asset protection tools approved by California law to safeguard your assets against these serious threats. Get the protection you need by contacting us today. Ensuring that you have adequate insurance. When it comes to protecting your assets from the threat of litigation, insurance policies are always an important concern. While it is important that you have the right amount of coverage for your business interests, it is just as critical that you have the auto coverage and homeowner’s insurance that you need to guard against the losses that can occur due to litigation. Protecting your business interests with the right legal structure. If you’re a sole owner of a business or involved in a business partnership, you may not have the protection you need to ensure that your personal assets are safe from potential lawsuits directed against your company. That can be addressed using the corporate or LLC business structure. Proper utilization of trusts. Trusts can provide protection in several critical areas of concern, offering spendthrift safeguards to shield assets from an heir’s bad habits, creditor protection, estate tax protections, and asset security that can help ensure that you qualify for nursing home care that you might need in the future. Leveraging existing legal protections. There are a variety of legal protections that you can leverage to secure assets against bankruptcy and other threats. For example, individual retirement accounts (IRAs) contain legal safeguards that exempt them from liquidation during bankruptcy, legal actions, or other attacks on your wealth. As you might expect, that list is but a small portion of the various threats that seek to consume your wealth. You’ve worked hard to accumulate those assets, and should have a right to preserve them for your benefit and that of your heirs. Our asset protection team can work with you to ensure that you have the protection you need to secure your nest egg from these any other threats. Asset protection involves a multifaceted effort to identify potential liabilities and reduce the risk that your wealth faces every single day. Our strategies employ the full range of available safeguards to shield your assets from any source of liability, so that your estate can avoid being consumed by lawsuits, creditor claims, wasteful heirs, and all those other threats that always seem to be lurking around every corner. 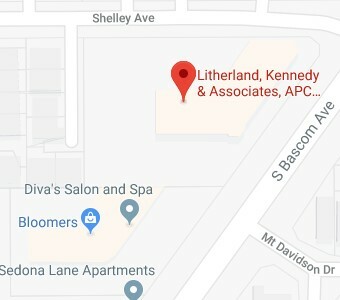 At Litherland, Kennedy & Associates, APC, Attorneys at Law, we can help you take the long-term approach to asset protection that you need to safeguard your wealth throughout your lifetime. Sensible wealth protection should begin early in life, with periodic reassessments as your needs change over time. We understand how hard you’ve worked to accumulate your wealth, and can assist you in your efforts to secure it against threats that seek to take it from you. If you want to learn more about how a San Jose Asset Protection Lawyer can help you, then contact us via this website or call (408) 356-9200 in Campbell or (831) 476-2400 in Aptos to schedule your free consultation today.